One of the first signs of spring around our house is when seed catalogs begin arriving in the mail. We eagerly flip through and dog-ear the pages with bright flowers and lush leafy green veggies. Nothing quite stirs up excitement in our house as gardening season does. Although my husband and I love spending all of our spare time in the garden, our kids had to learn to think of gardening as a fun activity as opposed to a chore. To help empower our kids to embrace their green thumbs, we tried a few kid-friendly tactics to make the garden a supremely fun place to be. The first trick? Get the kids to feel like they are invested in the garden. Soon after Groundhog’s Day, we start tending to seedlings in our house. To get the kids to show interest, we give them small window gardens where they plant radishes, green beans, peas, and zinnias to watch bloom in a few short weeks. While the seedlings are busy turning into small plants we take the opportunity to explain the life cycle to our kids. They compare plants and show pride in their ability to grow something all by themselves. Next, we ask our kids to be the architects of garden space to make them feel a sense of importance. Once the weather warms up and our indoor seedlings are strong enough to be planted outside, we enlist the help of our kids to plan out fun garden shapes. 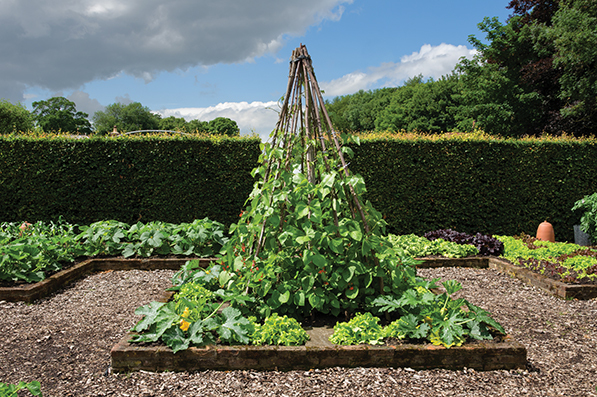 Last year, they dug up a circle that was eight feet wide and with the help of dad, created a climbing teepee for walking stick beans and nasturtiums! Once the plants were big enough, the kids had a secret hide-away to play in. They’ve also created spectacular “pizza bars” in the main vegetable garden in which all the plants double as pizza ingredients like tomatoes, basil, garlic and onions. The third trick is to appeal to their inner fascination with all things gross by having them help us to create healthy compost with worms. With the help of the internet and a couple of trips to the local library, our kids have learned all about the importance of saving kitchen scraps for healthy compost and the marvelous process of how foods can decompose to create nutrient rich soil for the garden. Not all days are great for being in the garden, though, which is where trick number four comes in handy. When it rains or storms out and the kids are stuck inside, we give them fun art projects to help keep their little thumbs green. A few smooth flat rocks from the backyard and some acrylic paint is all we need to create bright, colorful garden markers. After the rocks are painted and dried we have the kids use their detective skills to figure which plants match which garden markers. They do this by matching images from seed packets or even seed catalogs to the plants in our garden. Keeping a family garden is a fantastic way to introduce kids to the concept of being good stewards of the earth and appreciating the work and time that goes into growing our food. When the plants are ready for harvest, we celebrate with a family dinner that includes all of the foods that the kids helped to grow. There is nothing quite like spending time in the dirt with your kids!